Harpocrates Speaks: 69 Doses...or Is It 53? Or Even Fewer? As of this writing, the FDA lists 81 vaccines approved for us in the U.S. Now, that list includes vaccines that are no longer used (e.g., smallpox), as well as vaccines that are not on the recommended schedule (e.g., BCG, rabies, yellow fever). There are also multiple brands of vaccine (e.g., Fluarix and Fluvirin) that cover the same disease but are made by different manufacturers. 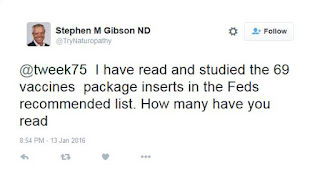 Eliminating the obsolete vaccines, the ones not on the schedule, and the multiple variations of the same vaccine, the number is way below Gibson's claim of 69, meaning his claim that he read 69 package inserts is wrong. Since I had shown the math that I used to arrive at my total number of doses, I asked Mr. Gibson to do the same. All he did was send me links to the recommended schedule I already referenced and an easy-to-read version of the same thing, which also adds up to 53 doses. Click to enlarge and find the dishonesty. Take a look at that list and see if you can spot the dishonest tactic that the NVIC is using. Yes, they break out the DTaP, Tdap, and MMR vaccines into separate, individual doses. NVIC is adding 16 doses to the list. Why is this dishonest? Well, when looking at the antigens alone, yes, there are 69 doses of antigen that a child receives. 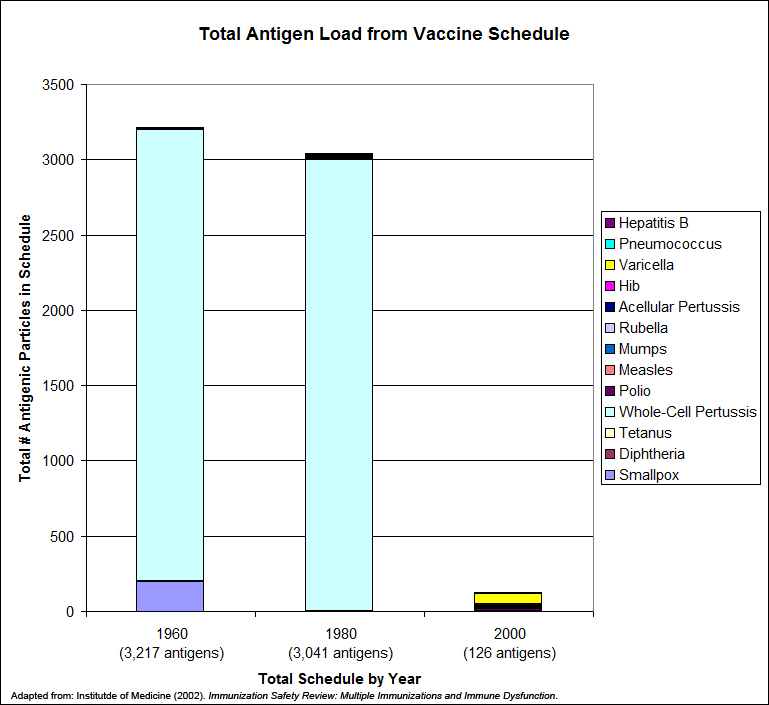 [Edited to Add (1/21/16): It should be noted that the overall antigen load in the vaccination schedule has been decreasing, even though the number of vaccines has increased, over the past 50 years. 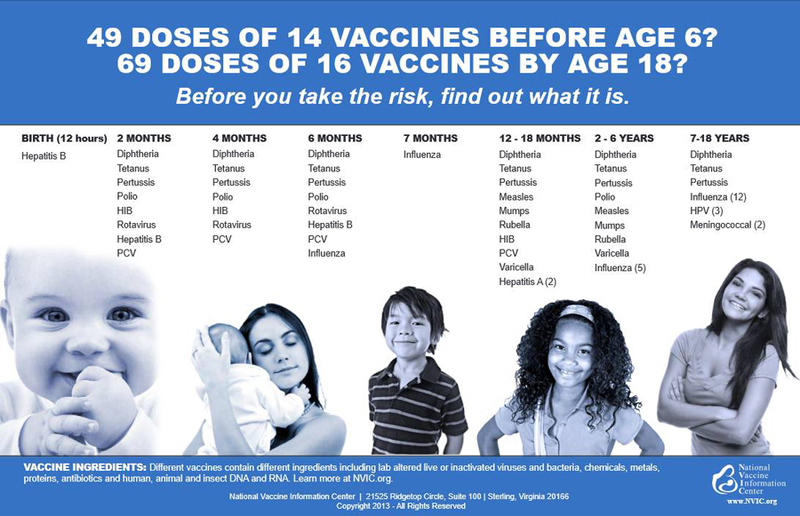 But their poster implies that it's 69 doses of the complete vaccine (i.e., antigens plus all of the other stuff like stabilizers, liquid vehicle, etc. ), especially given their footnote about vaccine ingredients. That's not the case. Let's look at it this way. There is a stand alone measles vaccine (e.g., India's M-Vac), but it isn't used in the U.S. M-Vac is given in a 0.5mL dose. In the U.S., the MMR vaccine is also a single 0.5mL dose, not a 1.5mL dose. You can see, then, why listing measles, mumps, and rubella out separately misleads people, and why the claim of 69 doses by age 18 is false. And even 53 doses is a bit high. There are newer combination vaccines that mean even fewer injections. For example, Pediarix (PDF), given in a 3-dose series, combines the DTaP, HepB and IPV vaccines into one, meaning 6 fewer doses (3 doses of HepB and 3 doses of IPV), bringing the total doses a child receives down to 47. Or there's Pentacel (PDF), which is given in a 4-dose series and combines DTaP, Hib, and IPV. Using that would eliminate 7 doses from the total (3 doses of Hib and 4 doses of IPV), bringing the maximum doses received down to 46. The next time you see someone claim that kids get 69 doses of vaccines by the time they're 18 years old, you can rest assured that they have either not done the math, simply taking the word of others for granted; misunderstood what they were counting; or they are lying. I'd recommend being charitable and assuming that they either haven't done the legwork to count things up or they simply misunderstood. But then, I tend to assume the best of people. 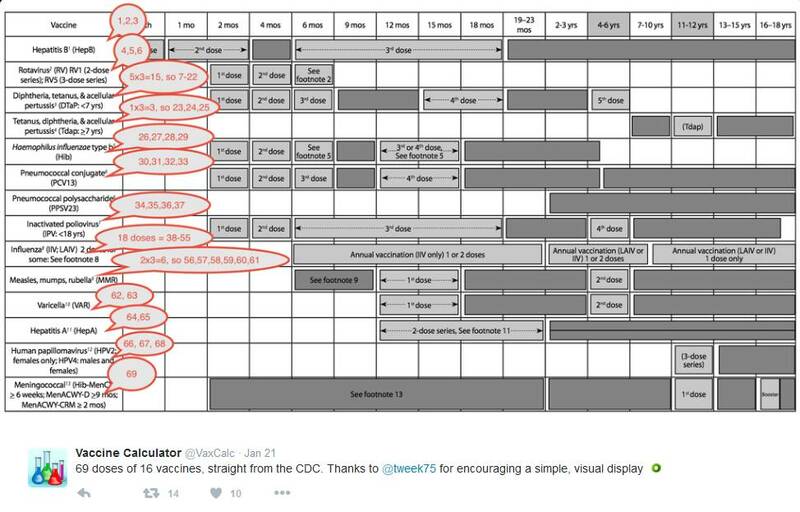 When I asked if they thought each time a child got a DTaP they got a 1.5mL dose, they responded, "Stick to "dose" as used in CDC schedule. 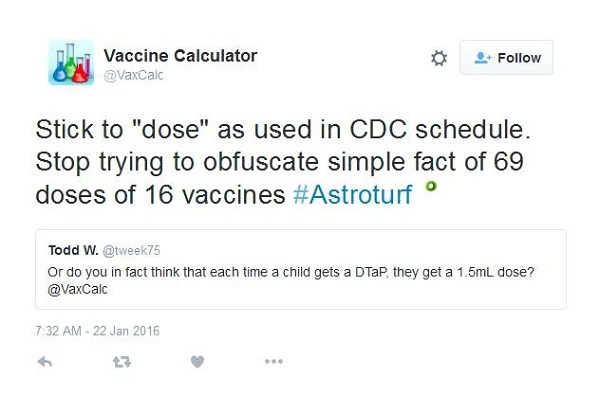 Stop trying to obfuscate simple fact of 69 doses of 16 vaccines #Astroturf". 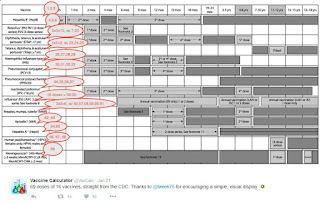 Notice that the CDC schedule in VaxCalc's own image notes "1st Dose", "2nd Dose", etc., which adds up to 53, not 69. I've written a follow-up to this post that I hope clears up some things. You can read it here. Perhaps he learned to count from D. Marie. I'm currently being exposed to many thousands of antigens, some quite novel to my body, as I've moved to quite a different environment than I have lived in for the majority of my life. I mean, there's a whale of a difference between SW PA and NW LA and I'm sure spring will be even more, um, interesting. 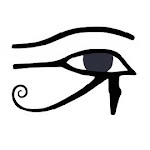 Antigens are ubiquitous in this world, be they allergens or various microorganisms. In the latter case, they could be harmless microbes or pathogens. Regardless, we're literally bombarded by microbes of all sorts, including those who could be pathogens, yet we amazingly - at least to the antivaxer crowd, survive quite well. But then, in their ignorance, they'll proclaim that "I have a strong immune system", which is poppycock, as cytokine storms kill those with strong immune systems. But then, they're just another fine example of the Dunning-Kruger effect. Wzrd1, thank you for bringing up antigen exposure. 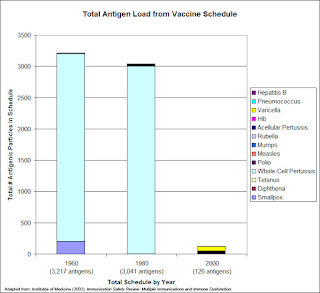 It reminded me of another point that I meant to include (and have added) that the overall antigen exposure from the vaccine schedule has been decreasing as technology improves, meaning that even though there are more vaccines on the schedule today, they expose children to fewer antigens than were in the vaccine schedule of the 1960s or 1980s. I don't know about USA but in Australia the influenza vaccine is not on any schedule and if it was why would it be given at 6 and 7 months? I think they perhaps mean HiB but even then it wrong. HiB is given at 2 months, 4 months, 6 months and 12 months. There is so much wrong with that list I don't know if they're deliberately making it up or just stupid. The flu vaccine is recommended by the CDC because of the risk of complications, especially for children under 2 years old, but it's generally not required for school attendance. The reason I think they put influenza at 6 months and 7 months is because 6 months is the earliest recommended time for a child to get it, and it's recommended that they have a second shot 4+ weeks later. One dose and they probably will not mount a strong immune response. The ages that they list for each vaccine are accurate. 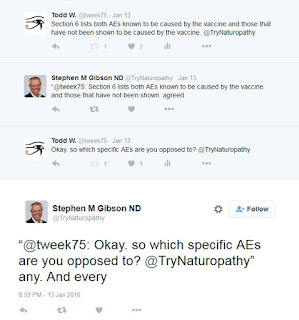 What is wrong is that they split out DTaP into three separate vaccines. Same with MMR. That is why it is dishonest and misleading, because children don't get separate vaccines for those. Thank you for admitting that you're dishonest and dumb, Gibson. The essence, but not the details? Do you maintain that children receive 69 doses? 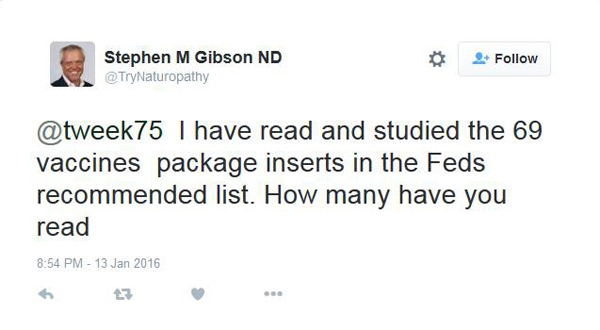 Do you maintain that you read 69 vaccine package inserts? Also, I noticed that you mentioned on Twitter that my post painted you in a less than flattering light. Well, you have no one but yourself to blame for that, since I have simply shared what you stated. If you feel that I have reported anything incorrectly, please feel free to point it out and provide evidence that I have done so, and I will correct my post. Again, if you feel that anything in my post is in error, by all means, point it out and provide evidence to support your position. I will correct my post as the evidence warrants. If, however, you would rather call me names and choose not to offer anything substantive, then my post will stand, and your claims and behavior will remain for all to see. Why do you think insults are a valid substitute for scientific evidence? Stephen, your use of punctuation is better than your use of facts. Apples to oranges. 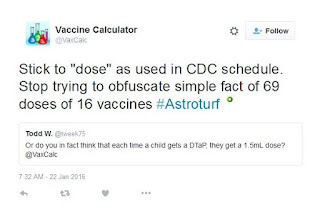 Your definition of "dose" is a cleaver way to minimize the actual vaccine count. You (and the CDC) confuse the meaning of *injection* with *dose*. You attempt to count three individual vaccines as "one dose" simply because they are combined into ONE INJECTION. The meaning of injection and dose are not interchangeable. 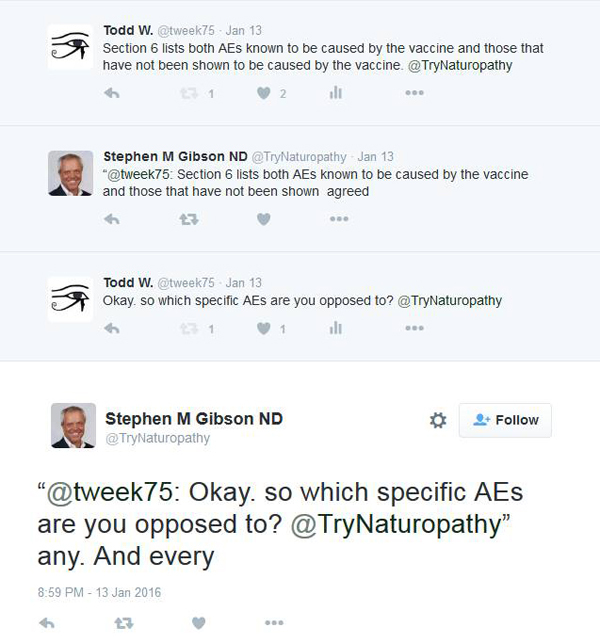 To be clear, the schedule for DTaP, MMR and Tdap are in fact *injections* of a combination of one dose EACH of THREE different vaccines. This amounts to THREE DOSES in ONE INJECTION administered multiple times. But of course you're smart enough to understand this - you and the CDC simply take the rest of the world as ignorant fools.